The 2018 edition of Automotive Interiors Expo in Novi, Michigan saw more than 1,600 attendees visit the Suburban Collection Showcase in search of the latest product launches and demonstrations, while the show also helped highlight the future direction of car cabin technologies. Some 30% bigger than last year’s event, even more of the industry’s leading companies were on hand to reveal an exciting array of world firsts, exclusive announcements and the latest developments in materials, manufacturing, lighting, design and much more. One of the biggest themes at the 2018 show was the rise of smart vehicle surfaces, with many companies displaying creative ideas and solutions to turn non-active cabin elements such as dashboards and panels into interactive and informative features. Calsonic Kansei (Booth A307) presented a full vehicle dash concept, whereby the typical flat surfaces found on instrument panels utilize a translucent material to display vehicle data such as climate, temperature and time. The console offers touch-capacitive controls electronically printed beneath a wooden-finish section of the dash, achieved by in-mold structural electronics where the printing of the circuit is on the decorated part itself. Meanwhile Plastic Plate (Booth A501), a division of Lacks Enterprises, made the case for greater integration of lighting technology within materials. “With the rise of autonomous vehicles, the cabin will be more of a living room type space, so we are really focused on making sure passengers and drivers feel comfortable and have more individuality,” said Ryan Lacks, director, sales and marketing, Plastic Plate. The company demonstrated how its design and development is evolving as a result of changing consumer trends – with a particular focus on new 3D-textured finishes. Nakan (Booth A210), which specializes in synthetic leather created from PVC, TPE and TPO blends, exhibited its latest collection of synthetic leather finishes, including innovative effects created through 3D printing and slush molding. On its booth, visitors can find a full-size dash panel featuring one of the company’s IP skins created using slush-molding. “We have the capability of two-dimensional or three-dimensional printing, which can create different colors and designs,” explains Michael Cestkowski, development engineer at Nakan. Cabin lighting was also very much in evidence on the show floor. Oshino Lamps (Booth A428), displayed a number of lighting designs currently in production, as well as a dynamic lighting concept that is able to pulse and flash or welcome occupants into the car with a customized light display. “There are five lenses and each is individually activated with an RGB, so you can produce a stack or rainbow effect,” explained David Tyler, Oshino’s managing director. Tyler revealed that the company has also been looking at integrating lighting in further experimental areas of the cabin, including the steering wheel. The use of lighting could also be an important safety feature, preventing drivers falling asleep at the wheel. Oshino is currently experimenting with a blue light located above the driver’s sun visor, which is intended to keep the driver refreshed, much like natural light, as opposed to the number of red and orange lights on the road that can add to fatigue. Tyler also noted the increasing affordability of lighting, with ambient solutions once only found in luxury car models now being rolled out to cheaper vehicles. “The technology is becoming more available in more affordable models. The products we have are for Jaguar Land Rover, which is where you typically saw ambient lighting, but now we’re talking to people for opportunities for use within Honda Civics, for example,” he said. Carbon (Booth A310), which creates 3D printing machines, generated a lot of interest at this year’s show, with visitors curious about its work with sportswear company Adidas, for which it has created 3D-printed soles for sneakers. 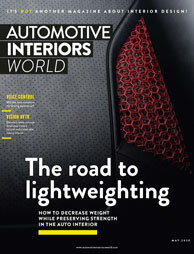 Norik Elchibegian, transportation and industrial sales director at Carbon, suggested the cutting-edge technology could potentially be a replacement for foam in vehicle seating in the future. Carbon is displayed its 3D printing machine at its booth, along with a number of products created using liquid resin. Diamond Coatings (Booth A304), which creates indium tin oxide coatings on interior parts for capacitive touch functionality, saw a lot of interest in one of its lenses that has been sputter coated with indium tin oxide (directly onto the part). The lens is found within every Jaguar Land Rover vehicle and is used to operate the cabin lighting without the need for a rocker switch. Jason Eite, president of Diamond Coatings, revealed that in over eight million lenses supplied, the company has had only one warranty claim. Meanwhile, Seal Methods Inc (Booth A108) was at the show to inform visitors it is now working with a new robot that can offer a more efficient way to disperse foam around fixings and help eliminate foam wastage. The next generation of HMIs and how drivers and passengers operate and interact with vehicles was another strong theme at this year’s show. Kurz Transfer Products, a specialist in printing and hot stamping, showcased a number of vehicle trim panels and displays featuring a backlit design and integrated interactivity. “A big trend right now is a day/night effect that can guide light through material and hide effects,” said Luitpold Haarlander, director of business development at Burg Design which is a member of the Kurz Group. Kurz has seen its colorful lighting concepts, which include plastic door inserts and panels, introduced in models for major OEMs and revealed it is working on its next generation of products, including those that could feature in self-driving vehicles. Elsewhere, attendees were able to explore a number of new methods for automotive interior manufacturing. IHI Hauzer Techno Coating presented its revolutionary electroplating process for plastic metallization that only contains two coating processes and removes the need for a lacquer top-coat for protection. Not only does this reduce the chemicals involved, it contains no chromium-6, a crucial step in meeting new REACH (Registration, Evaluation, Authorisation and Restriction of Chemicals) regulations and standards currently being considered by the European Union. “On an EU level, there will be a decision by the end of this year on how it will handle hexavalent chromium, and there is a strong lobby within the galvanic industry and electroplaters, but by the end of this year it will be clear what will be the way to go,” explained Emilio Rodriguez Cabeo, business manager Cromatipic, IHI Hauzer Techno Coating. Both visitors and exhibitors were united in their praise of this year’s show, commentiong on both the quality of exhibitors and products, as well as how beneficial it was to discover so many suppliers that were not previously on their radar, all under one roof. “I work for a supplier company of components and I came to look at what the local companies are. The show has grown this year and what I like is that I’m discovering brand new suppliers that I didn’t know about before,” said Aaron Matlen, an account manager at SMC. “The traffic has been very steady and we love the focus on interiors as visitors to the booth know exactly what they are here for. The growth is encouraging and we hope it continues in the following years,” said Mark Kakkuri, marketing manager for Gemini Group, which had a large stand at this year’s show. Next year’s Automotive Interiors Expo will return to the Suburban Collection Showplace in Novi,MI, USA on October 22-24, 2019.